Check out the tiny bumps. Yeah just so you know I can't open my mouth past here. It hurts. So a couple of days ago I woke up and my lips looked awful. 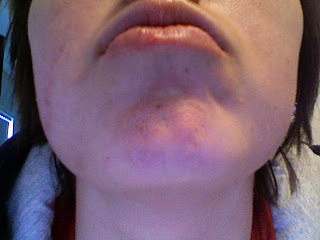 I had tiny bumps almost like a rash on the sides of my mouth. What in the world? I have no clue. I have never had cold sores or anything like this. A couple of days ago we went to go ask some of the pharmacists that work with Jordie and they said it looked like cold sores and gave me some over the counter drugs. Apparently I got them from Jordie. Since then every morning I wake up they have moved a little bit. Now they are on the top and the bottom and boy do they hurt...and itch. Oh brother. Jordan doesn't think they are cold sores anymore and he is kind of worried. Considering the fact that he is the man in our relationship and a Pharm Tech you can only imagine how much I am worrying. Not at all.... right. Dude. Ow! Did you figure out what was wrong? bird flu. That's my professional opinion.